The book I'm looking for is a trilogy, about a young man who was bullied until he tattooed his entire body with protective runes (including his head which he shaved) and developed a ninja fighting style. In the second book he came across a young woman who'd been raped and taught her the fighting method and tattooed her as well. This book came out not that long ago, no more than a few years and I'm really ticked I can't remember only this much about it now that I want to re-read it. I read it around the same time frame as I did the Iron Druid if that helps. 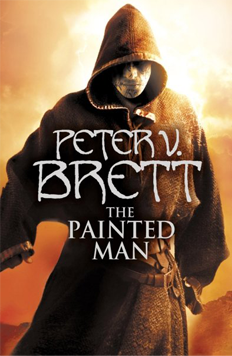 The answer is Peter Brett's Painted Man books, thank goodness someone mentioned it less than an hour after I asked. Many thanks! The novel follows three POV characters in their passage from childhood to maturity. They are inhabitants of a world plagued by the attacks of demons known as Corelings, which rise from the planet's core each night to feast upon humans. There are many different kinds of corelings, each associated with a particular element and each with different capabilities and strengths. The ongoing attrition of these attacks have reduced humanity from an advanced state of technology to a dark age. The only defense against the corelings are wards (magical runes) that can be drawn, painted, or inscribed to form protective barriers around human settlements. These are, however, fragile and prone to failure unless properly maintained. As the novel progresses, the protagonists each embark upon his or her own hero's journey in an effort to save humanity. Arlen is introduced in the aftermath of a coreling attack that claims 27 lives. Those happen often, usually due to marred or misplaced wards. He realizes that humans have been mostly on the defensive, hiding behind wards. During an attack which endangers his family he overcomes his fears of the corelings and attempts to fight them off, though with little success. He is disgusted by his father's cowardice after his mother is attacked, and leaves his home to seek training as a messenger, a traveling warrior-nomad responsible for maintaining trade and communication links between villages. As he matures he becomes determined to hone his skills and help turn the tide against the corelings. In the second half of the story, Arlen discovers the lost combat wards inscribed in the ruins of Anoch Sun. Betrayed by the men of Krasia, he uses the wards on himself, becoming "The Painted Man". Leesha is a thirteen-year-old girl who lives with her abusive mother and downtrodden father. After a slanderous rumor spread by her fiancé seems to destroy her chances of a respectable marriage and shows the true nature of many of her friends and the hypocrisy of the villagers, she devotes herself to learning the ways of herb gathering to care for the sick. Rojer enters the narrative as a toddler, the only member of his family to survive a coreling attack. He is rescued and adopted by an alcoholic jongleur, a type of roaming jester that frequently travels with messengers and performs in villages on the messenger's route. Rojer has a crippled hand, caused by the loss of two fingers in the coreling attack that killed his parents. This limits his ability to juggle but does not hinder him in the least when he plays his favorite instrument, the fiddle. He later remembers that the jongleur that adopted him actually caused the death of his mother, he confronts him on the road about this later, and the jongleur, in a fit of drunken rage, pushes him into the corelings. He then sees his mistake, and dies in order to save Rojer's life. With his fiddle Rojer can entrance the corelings with his music causing the corelings to follow him, anger them to rage, make them oblivious to others, or drive them away with jarring music. Rojer tries without success to teach others his skills with the fiddle. Rojer harbors strong unrequited feelings for Leesha. While you have already found your answer, I found a potential match that I figure is worth mentioning for future querents. D.M. Cornish's Monster Blood Tattoo trilogy is about a bullied young man (In the first book, Foundling, he's raised as an orphan and given the female name pinned to his blanket when found, Rossamund) who finds a way to distinguish himself among his peers by joining the Emperor's service as a Lamplighter (a group tasked with keeping the pathways between cities lighted, and therefore guarded from demons), and the focus of the second book, Lamplighter, has him pairing with a new character, a female monster hunter. Set in the world of the Half-Continent—a land of tri-corner hats and flintlock pistols—the Monster Blood Tattoo trilogy is a world of predatory monsters, chemical potions and surgically altered people. Foundling begins the journey of Rossamund, a boy with a girl’s name, who is just about to begin a dangerous life in the service of the Emperor. What starts as a simple journey is threatened by encounters with monsters—and people, who may be worse. Learning who to trust and who to fear is neither easy nor without its perils, and Rossamund must choose his path carefully. That said, despite the name of the series, I see no indication that he indeed received tattoos.